I was very impressed with the big machine we worked on. I thought you might like to learn more. Get a closer look at the company providing this workamping opportunity. Who Signs the Paycheck and How Much Is It? 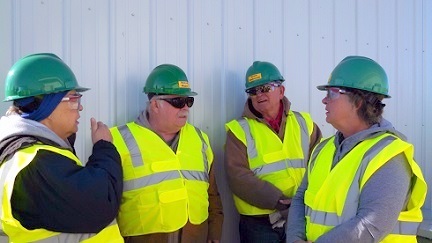 "American Crystal Sugar and Sidney Sugars hire over 1,300 workers stationed at 45 sugar beet receiving stations. These seasonal employees are an integral part of making yearly sugar production a great success. These short–term positions offer excellent compensation and attract applicants from all over the United States and Canada. Locals and travelers alike come to make a hefty paycheck while being able to enjoy various outdoor attractions and camp sites." 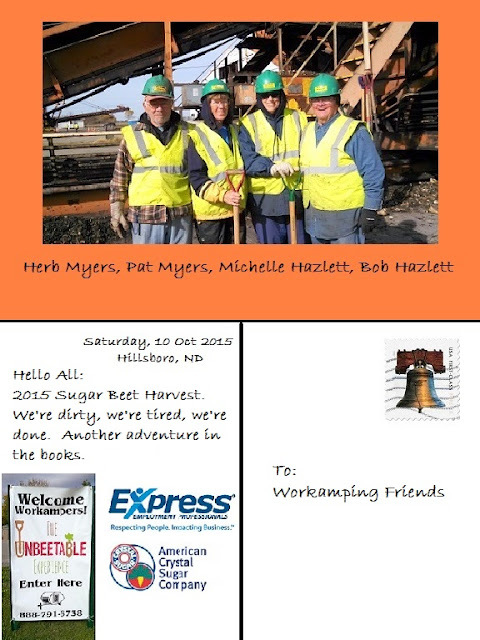 We first learned about the sugar beet harvest during the summer of 2014 while workamping in Pennsylvania. Subsequently, we saw Express Employment Professionals advertisements in WorKamper News. In January 2015, EEP had a booth at the RV Show in Tampa, FL. We visited with them. Along with Pat and Herb Myers, we signed up for the 2015 harvest. If you are interested in working the sugar beet harvest, Express Employment Professionals (EEP) are the people to contact. EEP is a national temporary help agency operated by many individual franchise owners. The franchisee for the sugar beet harvest is in Grand Forks, ND. Under the leadership of Scott Lindgren, they have been providing temporary workers to ACSC for seventeen years and their contract has just been renewed. I was impressed with the professionalism, thoroughness, and thoughtfulness of all the EEP employees. From our first contact in Tampa in January until we closed up our rig and headed home at the end of the harvest in October, they delivered on every promise and gave an accurate portrayal of the realities of the sugar beet harvest. They did not ‘sugar coat’ anything (pun intended). ** They maintained telephone contact with us through the spring and summer. ** They gave us very specific instructions on arriving at the campground and where and when to report for processing. ** The campground was ready and expecting us at the appointed time. ** Our employment paperwork was ready for us, although we did have additional forms to fill out and sign. ** EEP provided a Camp Host to act as a contact for any problems and to make sure of our well-being. The camp host also provided pet walking service. ** Scott Lindgren visited us at the campground to learn of any concerns and give us some background information on the sugar beet harvest. I will take issue with one statement in the published information quoted above. That works out to $1,389 per week per person. We found the work not hard, but at our age standing on concrete for twelve hours straight took its toll and we were soon popping pain pills regularly. American Crystal Sugar Company (ACSC) is the sugar producer in the Red River Valley along the ND/MN border and also operates a facility in Sydney, MT serving the beet growers in the Yellowstone River Valley. ACSC is a grower cooperative. 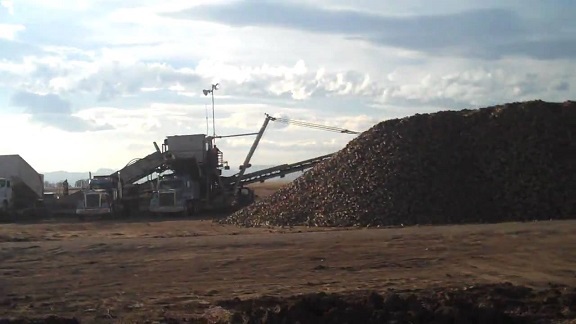 In a typical harvest, ACSC will acquire 11 million tons of sugar beets. These beets will arrive at the processing plants in 550,000 truckloads, each truckload representing the harvest from one acre of farmland. The beets come from the 2,800 growers who are members of the cooperative. 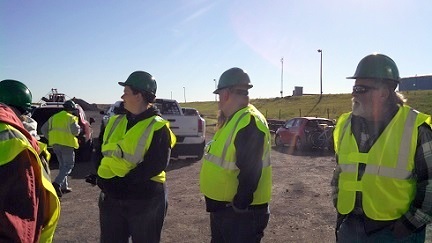 Our work site was the Hillsboro Factory, one of ACSC’s seven sugar beet factories. 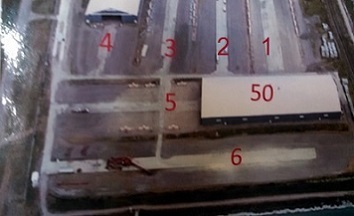 This factory was built in 1973 with major upgrades in 1997 and 1998. 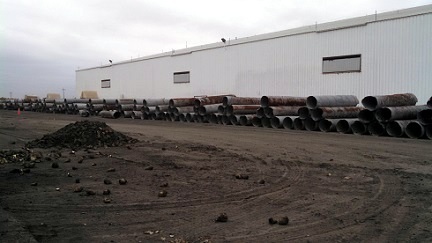 The Hillsboro Factory operates six piling locations: Hillsboro, Midway, Ada (north), Ada (west), Waukon, and Reynolds. We worked at the Hillsboro piling location where there are six pilers. Now you can wow your friends at cocktail parties with useless trivia until their eyes glaze over or until they go back to talking about their neighbors. Sugar is the most widely used sweetener in the world, with its closest substitute being high-fructose corn syrup. Other caloric sweeteners are not significant in the global sweeteners market, but their shares are rising due to increasing cases of obesity, diabetes, and growing health concerns among people. The global market for sweeteners totaled about $76 billion in 2012 and is projected to reach nearly $97 billion by 2017. In this market, sugar holds the majority share, about 85%. The global volume of sugar consumption is rising by about 4% per year, but the market value is dictated by sugar prices, which are extremely volatile. Sugar Beets require fertile soil and a temperate climate while sugar cane grows in a tropical climate. Production areas for sugar beets in the US are in fertile river valleys in the north. The Red River Valley supports the crop in North Dakota and Minnesota while the production in Montana and northern Wyoming comes from the Yellowstone River Valley. The North Platte River Valley is a growing area in southeast Wyoming, western Nebraska, and northeast Colorado. Growing sugar beets is done in Idaho along the Snake River Valley, and in Oregon in the Willamette River Valley. 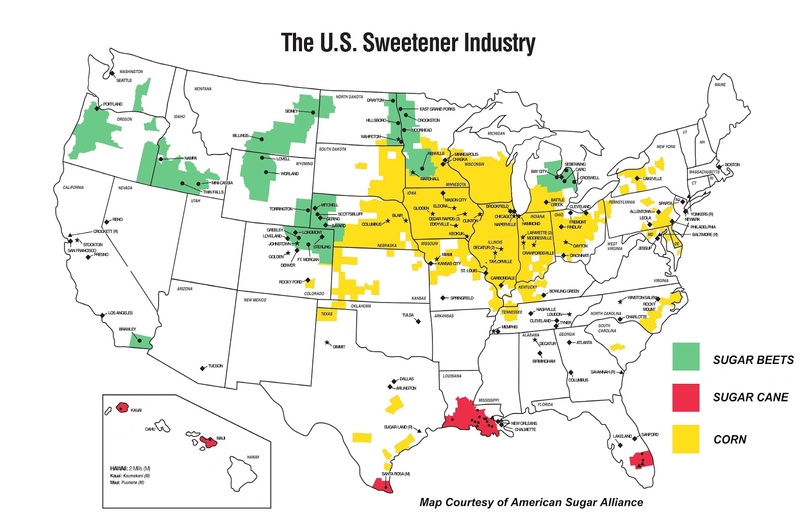 The American sugar industry has a significant impact on the nation’s economy. The industry creates 142,000 direct and indirect jobs in 22 states and contributes $20 billion in positive economic activity each year. Sugar beets are a root crop. Just like carrots, turnips, radishes, and potatoes, the part you want is in the dirt – not on a tree or bush. So harvesting involves dirt. Mechanical harvesters dig the beets out of the ground and throw them into a truck at a pretty high speed so a lot of dirt goes along for the ride and into the piler. This dirt is called “Tare Dirt”. American Crystal Sugar does not want the dirt, has no place to keep it, and certainly does not want to pay for it. 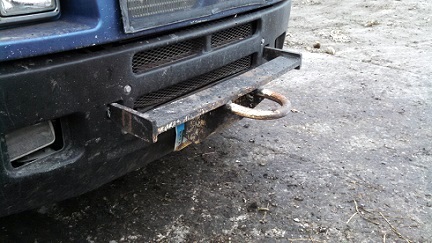 It is part of the truck weight coming into the yard and they want it to be part of the truck weight going out. 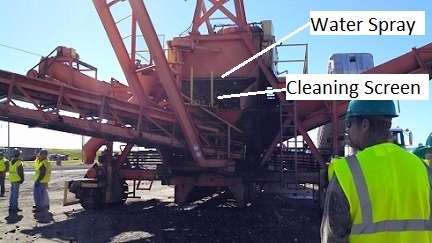 Pilers include large cleaning devices to carry out a secondary cleaning of the beets to remove all foreign materials that made it into the piler with the beets. 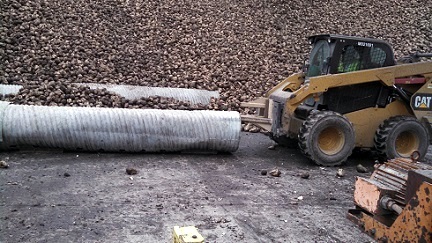 Beets are bounced and rolled, being scrubbed clean as they move; dirt and other foreign materials are sucked through the rolls, collected into a hopper, and returned to the truck as the last step in the receiving process. By this time loose dirt is gone and the beets are “pretty clean”, but they still carry some clinging tare dirt through the piler. The beets are subject to a deduction for that tare dirt. Tare determination, sugar percentage, and sugar loss to molasses are determined based on the sample at the quality laboratory in Grand Forks. That’s the story on Tare Dirt. 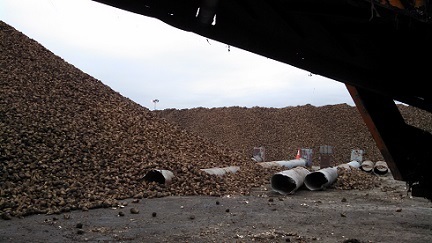 That phrase used derisively to describe a PhD surely fits a sugar beet pile. 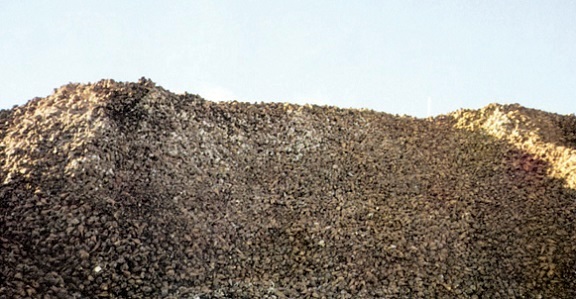 A piler is able to make piles of sugar beets over 200 feet wide at the base, and over 20 feet high, containing between 70,000 and 90,000 tons of beets. There is no angle from which I could take a picture that would capture the size of these beet piles. Maybe this diagram along with some pictures will do the job. 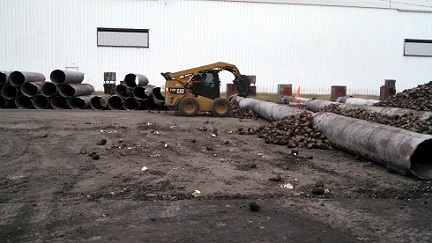 Sugar beets are harvested quickly and stored up to 180 days to await processing. 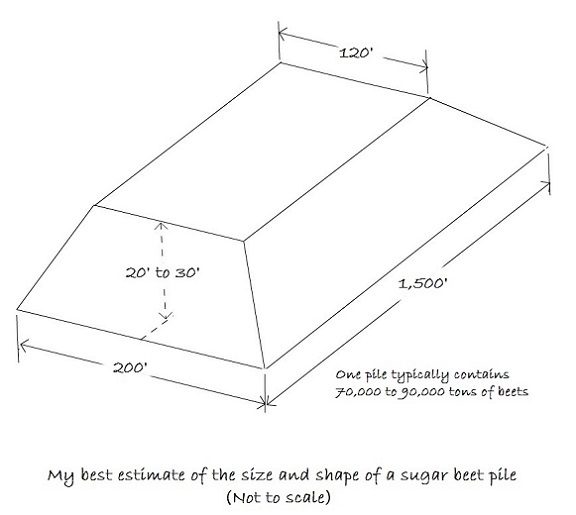 It is during this storage period, that sugar is lost through normal respiration. Respiration causes about 70% of sugar loss during storage, and decay accounts for 10%. The remaining 20% is the result of fermentation when the oxygen content is low because of poor ventilation, freezing and thawing cycles, and root desiccation. 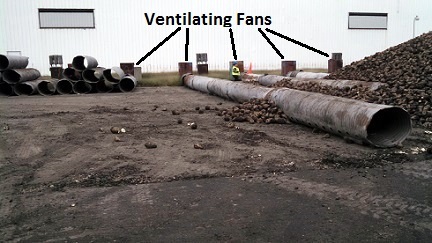 Storage losses caused by respiration have been controlled through the utilization of forced-air ventilation and subsequent freezing of storage piles after mid-December. Darting around the Piler, like pilot fish around a shark, is a Skidsteer. The Piler could not function properly without the Skidsteer. 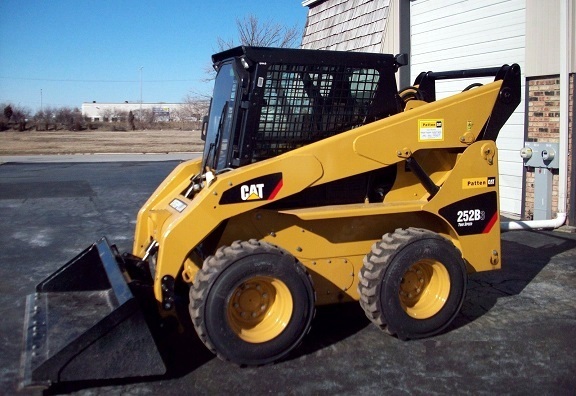 A skid loader, skid-steer loader, or skidsteer, is a small, rigid-frame, engine-powered machine with lift arms used to attach a wide variety of labor-saving tools or attachments. Many manufacturers have their own versions of this vehicle, including Kubota, Bobcat, Terex, Case, Caterpillar, Gehl Company, Hyundai, JCB, JLG, John Deere, Komatsu, LiuGong, New Holland, Volvo, and Wacker Neuson. Skid-steer loaders are typically four-wheel vehicles with the wheels mechanically locked in synchronization on each side so the left-side drive wheels can be driven independently of the right-side drive wheels. The wheels typically have no separate steering mechanism and hold a fixed straight alignment on the body of the machine. By operating the left and right wheel pairs at different speeds, the machine turns by skidding or dragging its fixed-orientation wheels across the ground. The extremely rigid frame and strong wheel bearings prevent the torsional forces caused by this dragging motion from damaging the machine. The skid-steering vehicle is turned by generating differential velocity at the opposite sides of the vehicle. Skid-steer loaders are capable of zero-radius, "pirouette" turning, which makes them extremely maneuverable and valuable for applications that require a compact, agile loader. Skid-steer loaders are sometimes equipped with tracks in lieu of the wheels and such a vehicle is known as a multi-terrain loader. “it can push material from one location to another, carry material in its bucket or load material into a truck or trailer” and that is what it does around a piler 24 hours a day. The Skidsteer cleans up trash around the piler. From beets spilled from the hopper because the driver dumped too fast to debris from the tare dirt dump, there is an endless stream of trash accumulating around the piler. Especially behind the piler and ahead of the pile. 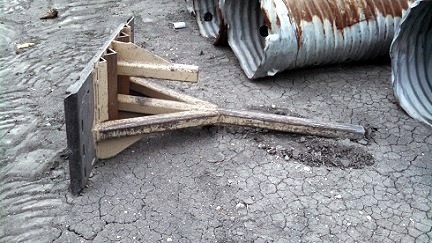 If this debris is not removed frequently, it will be buried in the pile. 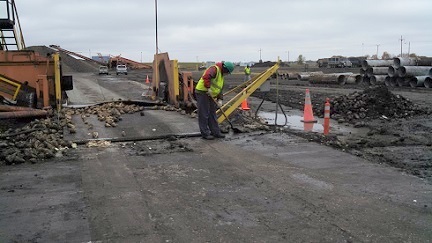 Beets spilled by the trucks as they dump are run over by the trucks that follow, quickly covering the concrete pad with a covering of mashed beets that becomes slippery and dangerous for both trucks and workers. 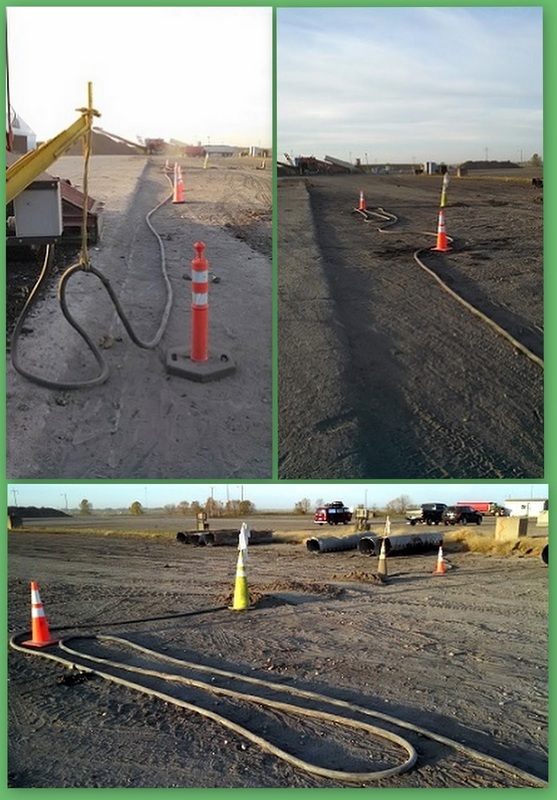 The most important job for the skidsteer, and the job requiring the most skill, is laying down the culvert piping for the forced-air ventilation system. As soon as the weather turns cold, the ventilating fans are turned on to chill then freeze the core of the pile. Like an Octopus with tentacles everywhere, this behemoth scared the snap out of me when I first saw it. Pictures and videos did not do it justice. I had no idea what I was going to do to it or what it was going to do to me. The dictionary says a Piler is “one that piles or heaps up; especially: one whose work is piling materials or products for storage, transportation, or processing”. 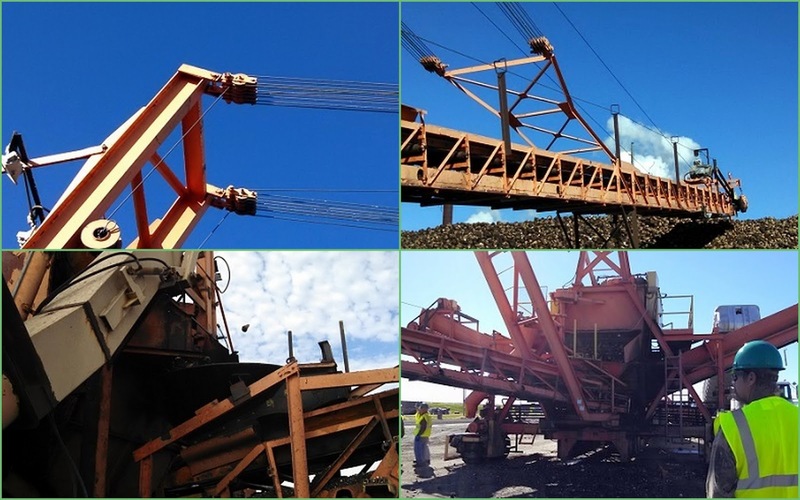 Our Piler is not a person, but a huge piece of machinery used to receive truckload quantities of sugar beets delivered from the growers and pile these beets for future processing. Kringstad Ironworks manufactures these for American Crystal Sugar Company. At the Hillsboro receiving station where we worked, there are six pilers. In just a few minutes, a piler can digest a large truckload of beets. 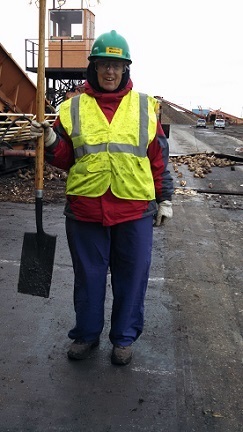 At a rate of about 250 tons an hour, this big guy can pile 5,000 to 6,000 tons of beets per day. 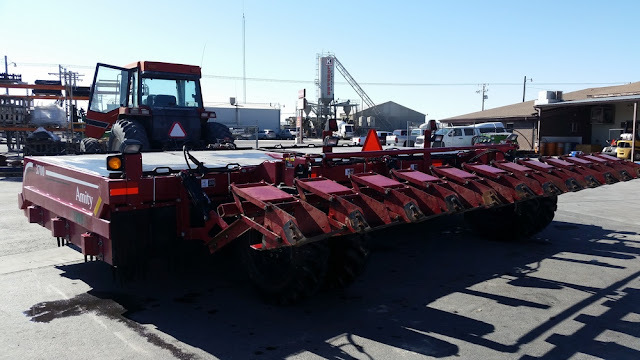 Part of the piler is a large cleaning device to carry out a secondary cleaning of the beets since the harvester has not cleaned all foreign materials from the beets in the field. The cleaning screen, known as the grab roll screen, is comprised of a slanting row of scrolled and smooth rolls. These rolls, perpendicular to the travel direction of the beets, turn at different speeds; scrolled rolls turn faster than smooth rolls. Beets are bounced and rolled through a water spray, being scrubbed clean as a result. 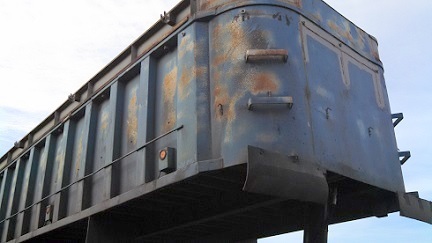 Dirt and other foreign materials (known as Tare Dirt) fall through the rolls, are collected in a hopper, and returned to the delivery truck as the last step in the process. 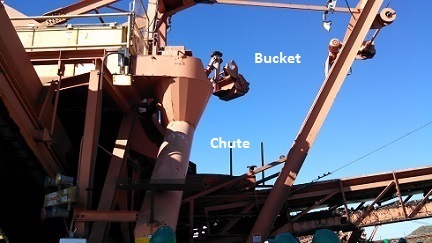 The piler includes a mechanism for extracting buckets of samples from the stream of sugar beets and dropping them down a chute where we bagged them. These samples are transported to the company laboratory in Grand Forks, ND and analyzed for sugar content. The result of this analysis becomes the basis for payment to the farmer. Despite its size, this thing is actually a movable electric appliance. A power cord approximately 200 feet long supplies electricity at 440 volts. 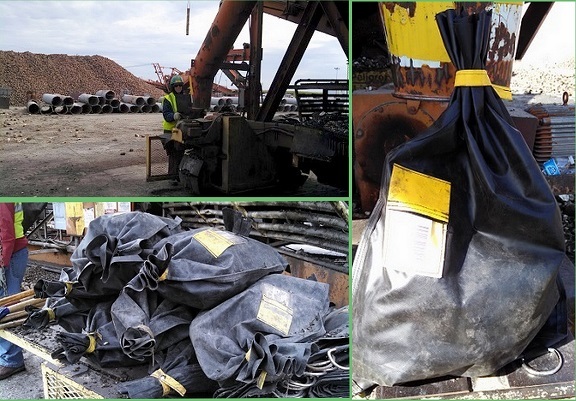 The operator moves the piler back as the pile builds up – typically a couple feet once every hour or so. This short (1:57) video was produced by Kringstad Ironworks, the piler manufacturer. It shows the piler throwing the beets to the pile, the beet truck dumping the beets into the piler, the cleaning process, the piler being moved, and finally the tare dirt being returned to the truck. 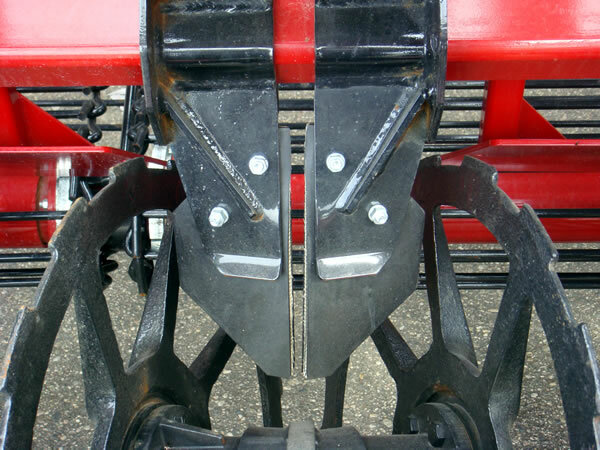 Now you know a little bit about Sugar Beet Pilers. 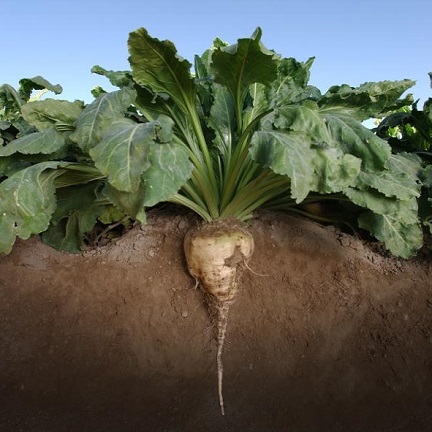 The sugar beet has a conical, white, fleshy root (a taproot) with a flat crown. The plant consists of a root and a rosette of leaves. Sugar is formed by photosynthesis in the leaves and is then stored in the root. A sugar beet weighs between two and five pounds. The foliage has a rich, brilliant green color and grows to a height of about 14 inches. The leaves are numerous and broad and grow in a tuft from the beet crown, which is usually level with or just above the ground surface. The beet root contains 75% water, about 20% sugar, and 5% pulp. The exact sugar contents can vary between 12% and 21% sugar, depending on the cultivar and growing conditions. Sugar is the primary value of sugar beet as a cash crop. The pulp, insoluble in water and mainly composed of cellulose, hemicellulose, lignin, and pectin, is used in animal feed. 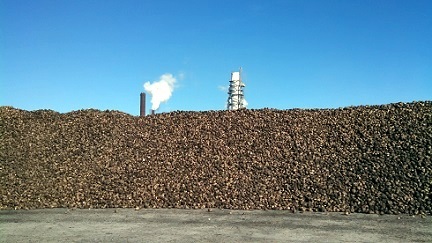 Sugar beet by-products, such as pulp and molasses, add another 10% to the value of the harvest. Sugar beets grow exclusively in the temperate zone, in contrast to sugar cane, which grows exclusively in the tropical and subtropical zones. The sugar beet is a root crop that flourishes in temperate climates where the growing season is about five months long. Farms are found in California, Colorado, Idaho, Michigan, Minnesota, Montana, Nebraska, North Dakota, Oregon, Washington, and Wyoming. Beets are planted in late March/early April and harvested in late September and October. 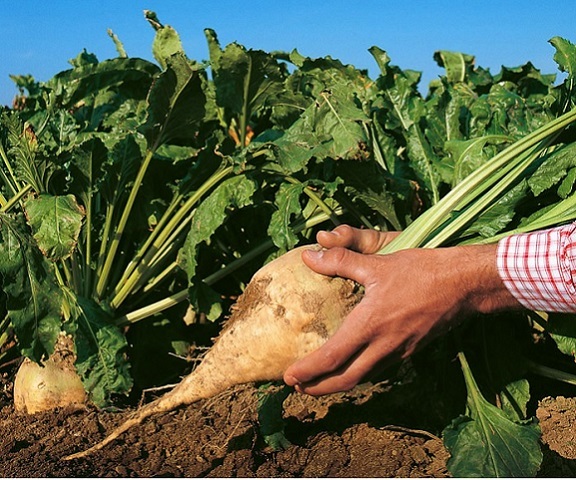 When fully grown, a sugar beet is about a foot long, weighs two to five pounds, and is about 18% sucrose. They are processed at 23 factories located near the fields because beets are a perishable vegetable. Factories generally operate around the clock, seven days a week, from October through April. Beet sugar represents about 54% of domestically-produced sugar. There is no difference between beet and cane sugar. 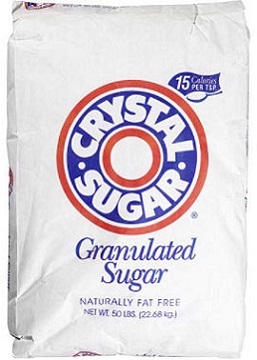 Some beet sugar brands you might recognize are Crystal Sugar, Holly Sugar, Western Sugar, Big Chief Sugar, Pioneer Sugar, White Satin, and Spreckels Sugar. In addition to processing pure beet sugar, sugar factories also produce a by-product known as dried beet pulp. The pulp is the dried fiber residue left after most of the sugar has been extracted from the sliced beets. 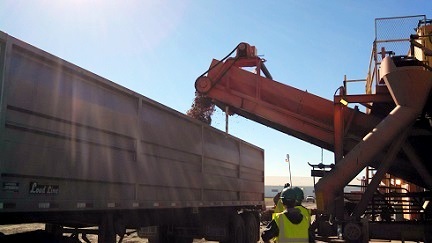 Dried beet pulp can be produced and shipped in many forms: plain dried, molasses dried (which contains approximately 25 percent molasses) and pelleted. This excellent feed is valued by dairy farmers to stimulate the cow’s milk flow and is widely used to feed cattle and sheep destined for market. In recent years, substantial quantities of pelleted dried beet pulp have been exported to Japan and Europe to assist their development of feeding programs and, in turn, help our country's balance of payments. Another important by-product is beet molasses, produced in quantities ranging from 4 % to 5% by weight of the beet and containing about 50 percent sugars. Beet molasses is used for the production of yeast, chemicals, and even pharmaceuticals, as well as the production of mixed cattle feeds. It is one of the best mediums for liquid cattle feed. As I was doing the research for this story, I noticed the word “campaign” was used often. Thinking about that, the word makes sense because the process is an annual agricultural thing. It may begin in the summer, but for sure it begins by 01 Oct at the start of harvest. I suspect it ends the following spring when all the beets are processed and the processing yards are empty and ready to start again. So how does the campaign get named? If named for the year of harvest, it would be “the 2015 campaign”. If named for the year when the process is complete and all the product is sold or for sale, it would be “the 2016 campaign”. I don’t know the answer? My understanding is this. American Crystal Sugar Company is an agricultural cooperative. Every year they contract with each of their members to grow and deliver a certain amount of sugar beets. I suspect the unit of measure is acres, since the tons of beets or pounds/tons of sugar is determined by Mother Nature and is unknown until the campaign is in the books. During the summer, company Agriculturalists visit the fields to check on the growing crops, advise the farmers, and predict what the harvest will look like. Pre–pile harvest begins in early September. Harvest deliveries are limited and controlled due to the warm weather and poor storage conditions. This limited harvest allows growers to open roadways through fields in preparation for the main harvest, which begins October 1. 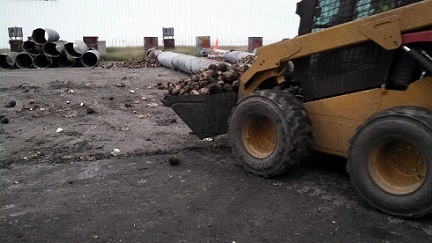 Growers deliver their sugar beets to a designated receiving station located throughout the growing area. 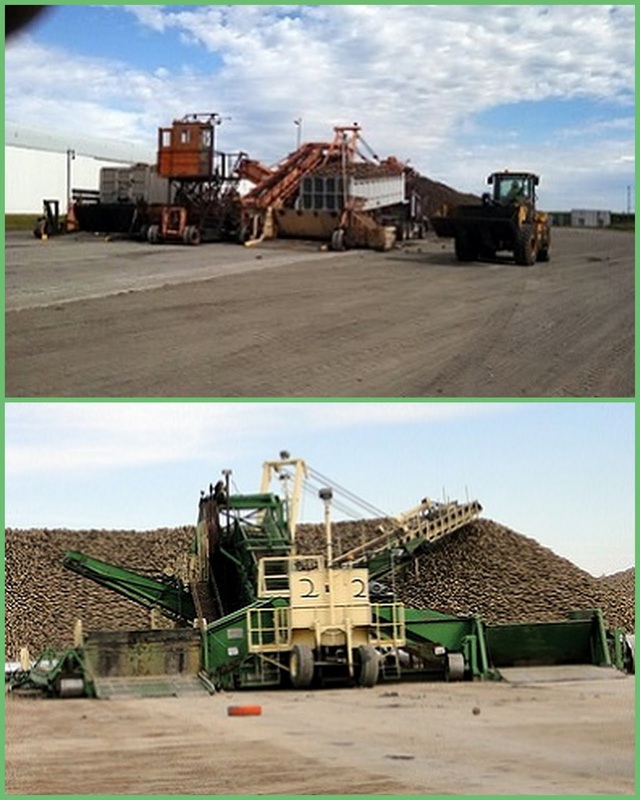 Sugar beets are harvested with two primary pieces of equipment. The Defoliator removes the green leaves and slices a slab from the top of the sugar beet root. 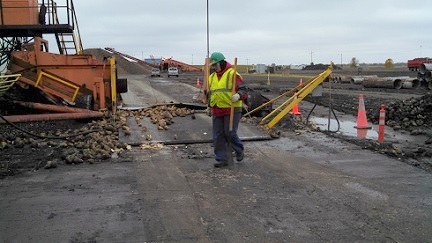 This removed slab is the growing point of the sugar beet and contains high levels of impurities, which impede the factories ability to extract the sugar from the remainder of the harvested root. 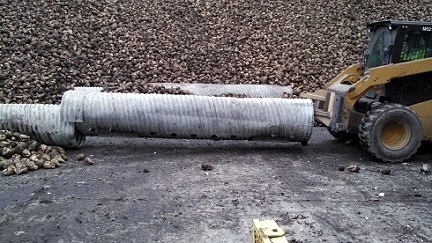 The sugar beet root is then harvested with a Pinch Wheel Harvester, which pinches the root and lifts it from the soil. The sugar beet harvester also separates some soil and conveys the sugar beet into a truck to be transported to a receiving station. 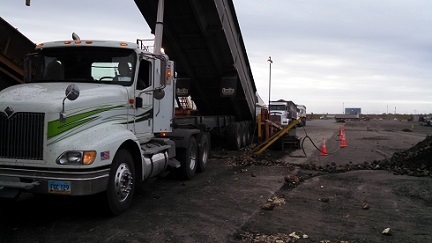 Trucks hauling sugar beets to receiving stations are weighed and off loaded on sugar beet pilers. 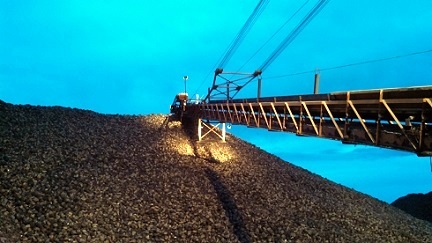 These machines also screen soil from the sugar beets and pile the sugar beets in large storage piles. 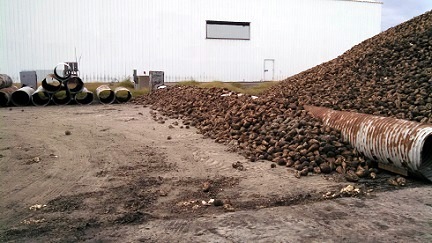 Samples of sugar beets are taken upon delivery to be analyzed for sugar content, purity and tare. Harvest is concluded in late October. 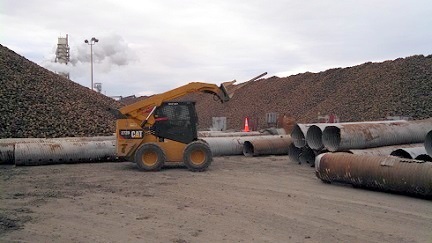 Throughout the winter, sugar beets are reloaded into rehaul trucks, which deliver the stored sugar beets to the factory for processing. 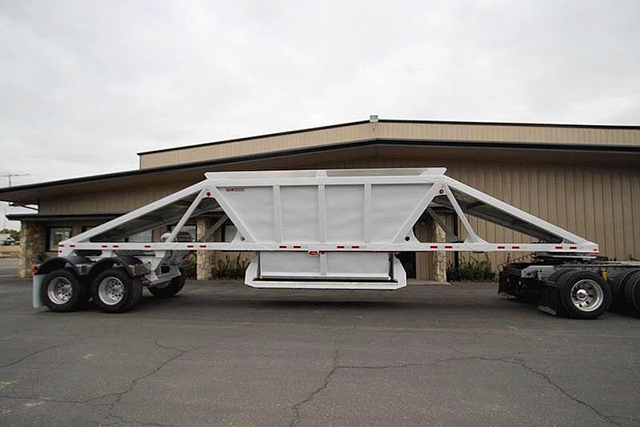 Large front-end loaders load belly dump trailers which haul 27 tons per load. 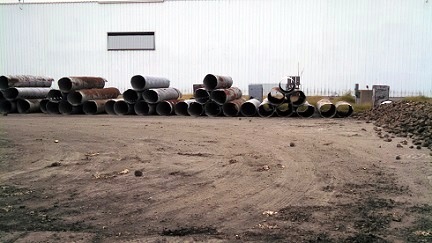 Piles are monitored for temperature during the storage term. 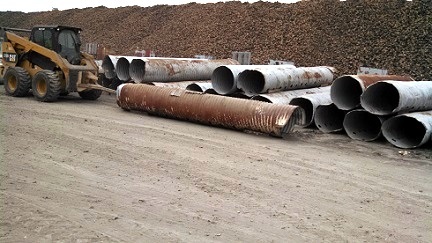 Some piles are also passive ventilated or forced ventilated to enhance storage conditions and allow sugar beets to be stored for longer periods. 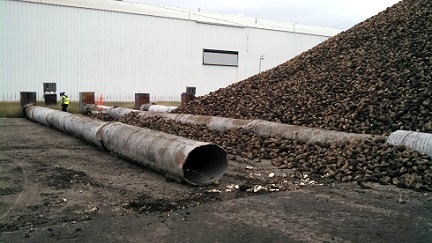 Sugar beets can be stored in piles as long as mid-March when the slicing operations will be completed. Then, it is time to begin the process all over again. There was not much opportunity for socializing beyond the members of our piler crew. However, I could easily see that the labor force was diverse — male, female; old, young; all ethnicities, with many Spanish speaking; very big men to petite women. We did get to meet one man who was living at our campground with his family. He worked the day shift, his wife worked nights. For about an hour, twice a day, at shift change, the Camp Host watched the kids while Mom and Dad switched. It didn’t take long for us to get acquainted with the truck drivers and discern distinct patterns. Most of the farms are agri–businesses. Some operating a fleet of 25 or more trucks. Some had the crops they farm included in their logo. One, for example, had a sugar beet, an ear of corn, and a sheaf of wheat cleverly woven into the name of the farm to make his logo on the doors of his trucks. We learned that many drivers were hired by the farmers just for the harvest and they too were working twelve-hour shifts. One told us that it takes about seven minutes to fill the truck and the truck holds beets from roughly one acre of land. It takes less than five minutes to dump the beets. Add some time for waiting in lines at the piler and twice at the weigh station. The rest of the time is commuting to and from the fields. Farmers close-by cycle much faster than those far out. So we could see the same truck and driver every half hour or so. 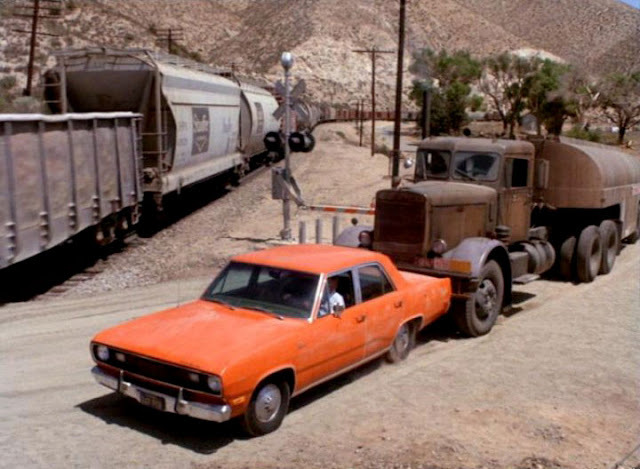 During busy times, trucks were lined up three or four deep on both sides of the piler. Sometimes wives and kids would ride along. Sometimes wives would drive themselves. Some hired drivers were women. One female hired driver was a single Mom from out of state and her son accompanied her almost all the time. Then there was the “pink lady”. Dang! I didn’t get a picture of her. One female driver wore a pink sweatshirt, a pink baseball cap, and makeup to the hilt. It only took a couple cycles to recognize her. One evening after work, I stopped at Casey’s General Store and she was working the cash register (without the sweatshirt and baseball cap). As I was checking out, I asked, “Do you have a pink baseball cap?” She lit up and replied “Yes. Are you working on piler #3?” I think most people have more than one job just to get by. On the front bumper of just about every truck is a fixture obviously meant for pulling the truck. I never noticed these on highway trucks. Since farm trucks spend a lot of time in the fields they get stuck in the mud often. These fixtures are for quick and easy hook up to pull them out. With many different makes of trucks, I started taking pictures of the front grill works thinking I might make a picture album for our grandsons. We’ll see. When a truck arrives at the piler, he/she pulls through, then the operator opens the hopper behind them. 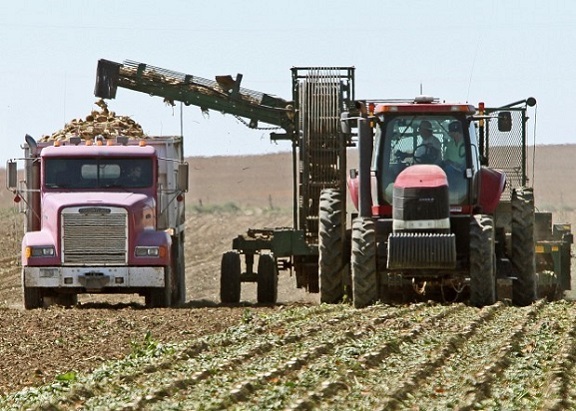 The truck backs up against the hopper and raises the trailer to dump the beets. 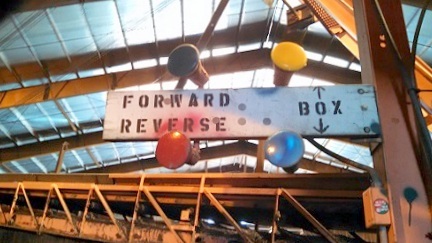 Forward, Back, Box Up, Box Down instructions are transmitted from the operator to the driver by lights positioned so that the driver can see them. Believe it or not, this was the first time in my life I had to punch a time clock. We had to clock in no earlier that seven minutes before eight and clock out no later than seven minutes after eight. So just around eight o’clock, the little building with the time clock got very busy. Thirty-six people clocking in followed immediately by thirty-six people clocking out. Work shifts were twelve hours long – 8 to 8. We worked days. On the very first day, they tried to assign us to the night shift. We put our foot down on that. When we signed up last January and again when we did all the paperwork at the beginning, we specified “days only”. We were not willing to stand out in the cold all night. They resolved that situation to our satisfaction. When we arrived for work in the morning, the sun was up and bright but it was still cold. As the day progressed, we peeled off layers of clothing. Then at sunset we began putting them back on. The last two hours were always dark, cold, and long. We looked forward with anticipation to the approaching headlights of the night shift. Sometimes it was just another truck wanting to be our last customer for the day. We were allowed to bring our vehicles to the area near the piler so our truck became the place where we took breaks and ate lunch. We purchased enough freezer blocks to have two sets – one working in the portable cooler and one at home in the freezer. We switched them every morning. Every day we brought sandwiches, six bottles of water, and one or two containers of yogurt in the cooler. Plus we had packages of cheese crackers, peanut butter crackers, and bags of peanuts in our truck. So at every break, we used the Porta–John then went to our truck for something to eat and drink. Most trucks we encountered during the sugar beet harvest were clean and well cared for. Dirty at the moment because of their job, under the dirt you could see a fine piece of machinery. But this old guy got into my head and cracked open the memory of a movie I saw long ago. Time for some research. 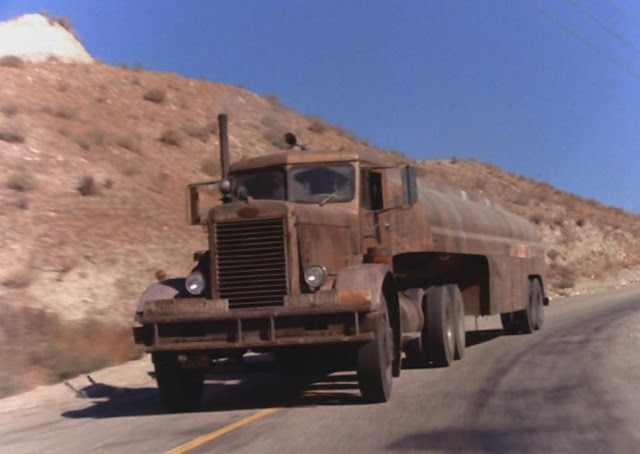 The only memory string I had to grab was my recollection that the main character of the movie was Dennis Weaver. That's all it took. A quick search brought it all back. 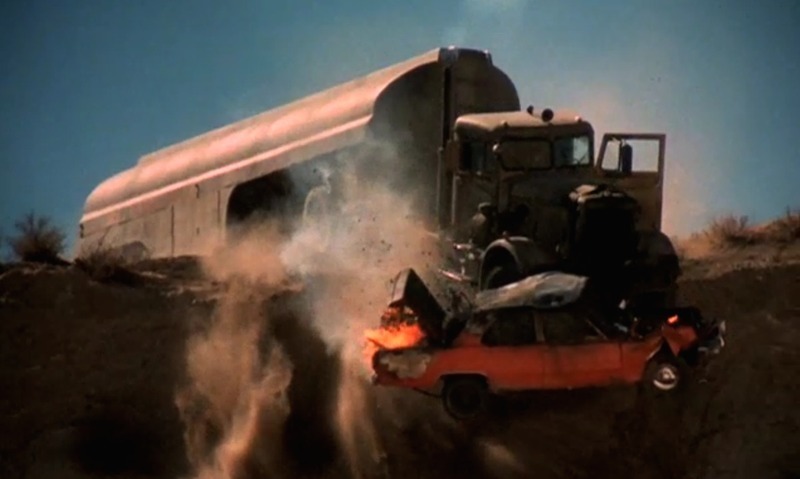 The movie was Duel. Filmed in 1971, it was Steven Spielberg's first directing job. 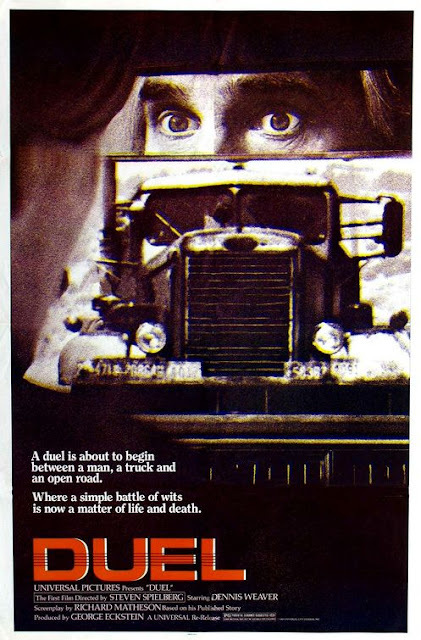 The film's protagonist, David Mann (played by Dennis Weaver), while traveling on a freeway, gets chased by a big truck whose driver, for no explained reason, wants to kill him. The truck, a large rusty 1955 Peterbilt 281 gasoline tanker is one of the most sinister automotive movie characters ever. The truck driver is never fully shown. This gives more character to the truck, to the point that the vehicle becomes the actual antagonist. I think I’ll buy the CD and scare the snap out of my grandsons during our Christmas visit. Back on the subject. Without the Skidsteer, the area around the piler would quickly become overwhelmed with trash. Beyond that, we worked at keeping our work area clean. We cleaned up with shovels and brooms what the Skidsteer could not reach. Crushed beets made a mess faster than the Skidsteer could keep up, especially since the Skidsteer had the task of laying down the culvert for the forced ventilation system. Mud quickly built up on the bottom of our boots. Scraping off the mud and sweeping it away was a constant chore. Not unexpectedly, fatigue was a problem for us. We are not in great shape physically and standing on concrete for twelve hours straight did have an effect. The first night we were absolutely wiped out – straight home, leave the muddy boots outside, grab a snack, and crash. It got better as the days passed (maybe it was the pain pills). However, accumulated fatigue began to take hold and by the last day I hurt from head to toe. We signed up expecting three weeks. By day ten I seriously doubted that I could have made three weeks. When Express Employment Professionals called to “lay us off”, I asked about how fast we had to vacate the campground. They said, “Don’t worry about it. Take your time”. The campground manager told me that EEP had rented and paid for sixty sites for forty–five days, so there was no hurry to clear out. That was good to hear. We took a couple days to relax, do one last laundry, and pack up. We left Hillsboro on Wednesday, 14 Oct and began our trip east.